It looks like there is another upgrade in the works for both Maya and Max. Nothing much to write home about – I think… It looks like the improvement that is at the top of the list for both products is that they are now both compiled for 64 bit machines. This is kind of cool! I had the privilige of working on a commercial for OilStop Inc. late last year and the commercial won a bronze Telly Award in two categories! I did the character animation, modeling and rigging of Ollie the oil can. Thanks to Jeff Brockman of OilStop for creating the concept, directing the live action and for putting it all together! If you have the bandwidth (12mb) you can view the commercial here. If you have seen my old Animation Mentor training exercises you will notice that in one of the clips I have the character riding a bicycle across the finish line. The exercise, if I remember correctly, was to express one emotion. I chose the character on a bike because I really enjoy cycling. My yearly highlight in the sport is keeping track of the Tour de France. This year there doesn’t seem to be ‘one’ favorite in the race (as in previous years when Lance Armstrong dominated the Tour), but today’s stage was pretty intense. Floyd Landis was amazing. He was in 11th position in the previous stage and today he pulled up his bootstraps and won the stage ending up in 3rd position overall (only 30 seconds behind the first place overall leader Oscar Pereiro). Landis’ average speed over 200 km of mountains was 37.15km/h! Congrats Floyd! For more information visit the le Tour’s site. In the past month or so, I’ve embarked on learning how to draw the human figure. I think that the figure is one of the most, if not the most, challenging objects to draw. The problem is that the shape never stays exactly the same and there are a myrriad number of poses that the figure can achieve and angles that it can be drawn from. Things get even more complicated as the figure can be male, female, child, overweight, skinny, muscular, tall, covered in clothing etc. So how do you go about drawing the figure? A temptation when drawing the figure is to start out drawing in all the details. We start by drawing in buldges, indentations, curves and contours and …. well, we get so caught up in the details that we forget the foundation. One of the best books that I have found on learning to draw the human form is Andrew Loomis’ book “Figure Drawing for all it’s worth”. It’s an older book (1949) and I don’t believe that there are any reprints in the making, but (a bit pricey) used copy can be found at amazon.com. Loomis begins by talking about the figure’s proportions. If you don’t get those right, everything else will look wrong. In order to draw the figure with the proper proportions the trick is to draw a lot of the same figure (from the front and side). That helps your mind get used to the length of each main body mass. 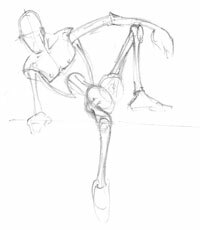 To help, Loomis suggests using a simplified version of the human body, what he calls the ‘mannikin frame’ (see my version above). The mannikin helps not only to nail down the proper proportions of the main body parts (head, neck, rib cage, shoulders, arms, legs, hips, and feet), but is also great to setup and test poses and camera angles. Loomis suggests that you master the mannikin (drawing it from all conceivable angles and in all sorts of positions) and then worry about adding bone, muscle, sinew and drapery details later. The mannikin is basically the ‘blocking’ stage of the drawn figure. Get that right, and the foundation will be right. After you get that foundation right, then you worry about the details. So I’ve been practicing drawing mannikins for the last month or so. My initial attempts weren’t too encouraging, but the trick to not getting discouraged is to push through the last drawing and draw another. Even though I’m not completely satisfied with my mannikin above, I think it’s getting better… it sort of looks human even.